If the Internet of Things is your thing, then come and join Angers’ digital community network. Angers is home to France’s 1st Cité for the Internet of Things since 2015. A hub for connected objects and business accelerator, the Cité enables the fast growth that innovative enterprises need. The Cité de l’Objet Connecté flies the “Made in France” flag far and wide, clustering industry partner companies around major shareholder Eolane. Angers is France’s leading city for the Internet of Things (IoT). The region counts 900 businesses and 7000 workers in the digital and electronics sector, which has been firmly established for 40 years. Some of the biggest names in the European electronics industry have their head office in Angers, including Bull, Eolane, Evolis and Creativ Eurecom, along with newer cutting-edge enterprises which have already secured a strong foothold in the industrial landscape such as Novotech, Logosapiens, Qowisio and Sapalem. ESEO, a general engineering college for smart objects and systems, provides a talent pool for Anger’s digital ecosystem with its 1300 students. Other local engineering colleges such as ENSAM and ESAIP offer digital training courses. We Network is a digital business cluster in Western France. Based in Angers, it is a byword for excellence in the electronics industry. Austin Angers Creative fosters the growth of innovative Angers-based businesses, through Angers’ cooperation with Austin in Texas. Well-reputed as a test market and experimental playground for many national brands and franchises, Angers is where PAVIC is based, an organisation which connects industry leaders, researchers and students as they invent the town of the future. With WifiLib, residents and visitors enjoy free access to a high-speed Wi-Fi network so they can explore new uses for it all over the town. In Angers, everybody has access to solutions for developing digital projects. Economic development agency ALDEV, the We Forge co-working space, the Cité de l’Objet Connecté, the Maine-et-Loire Chamber of Commerce or Angers Technopole are all resources available to help to get innovations off the ground. 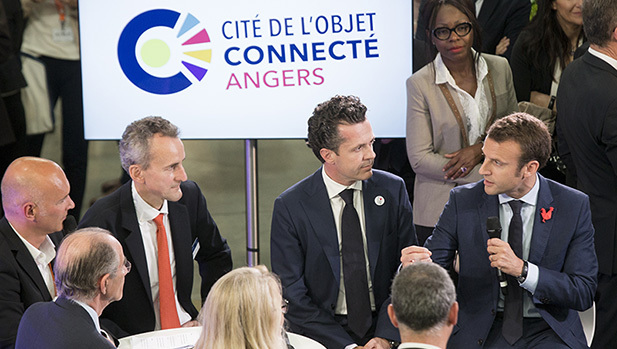 Nowhere is better placed for nature and digital innovation to thrive than Angers… The potential and growth opportunities provided by merging these two sectors are brought up regularly in industrial projects and seminars organised in the area. As a test town for GreenPods – smart, connected flower pots – Angers also hosts “connected” industry events such as the connected objects symposium. The Cité de l’Objet Connecté welcomes digital enterprises who want to organise conferences, seminars or product presentations in the conference hall and the showroom.